What is Christmas without food and drink? I would like to introduce Christmas Dinner enjoyed by people in different countries throughtout the world. IntroductionChristmas dinner is the primary meal traditionally eaten on Christmas Eve or Christmas Day. In many ways the meal is similar to a standard Sunday dinner. Christmas feasts have traditionally been luxurious and abundant. King John of England, in the year 1213, ordered about 3,000 capons, 1,000 salted eels, 400 hogs, 100 pounds of almonds and 24 casks of wine for his Christmas feast.Christmas dinner around the world may differ and the traditions present below can reflect the culture of the respective country it is being celebrated in. Turkey is present in a fair number of these meals. Australia Christmas dinner in Australia tends to be very similar to the traditional English version.However due to Christmas falling in the heat of the Southern Hemisphere’s summer, meats such as boar, turkey and chicken are sometimes served cold. Barbecues are also a popular way of avoiding the heat of the oven. Seafood such as prawns (shrimp) is common, as are barbecued cuts of steak or chicken breasts, drumsticks and wings. In summer, Australians are also fond of Pavlova, a dessert composed of berries atop a baked meringue. Fruits of the season include mangoes and cherries. Austria Christmas cuisine in Austria is similar to that of Germany. Christmas Eve is the celebration of the end of the pre-Christmas fast. Christmas Eve is historically the day that the tree is decorated and lit with real candles, so that the Christkindl may visit. Christmas Day is a national holiday in Austria and most Austrians spend the day feasting with their family. Fried carp, Sacher torte and Christmas cookies ( lebkuchen and sterne) are eaten, and many other chocolate delicacies including edible Christmas ornaments. Christmas dinner is usually Goose, Ham served with Gluhwein, Rumpunsch, and Chocolate Mousse. Brazil In Brazil, the Christmas meal is quite a feast,( served in the evening on the 24th of December) offering large quantities of food, such as a wide variety of dishes which include fresh vegetables (including Couve a Mineira – Kale, highly seasoned with garlic), luscious fruits and Brazil nuts. Accompanying these are bowls of zesty, colorful rice and platters filled with ham and fresh salad (sometimes cold potato salad is also served) served with roast turkey. Also in some parts of Brazil features roast pork, roast Chicken and fish. 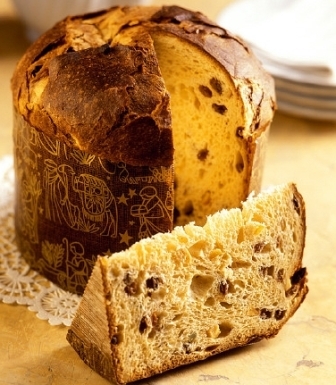 Other Christmas items include a variety of desserts such as lemon tart, Nuts pie, chocolate cake and also Panettone. Canada In English Canada, Christmas dinner is similar to that of its colonial ancestor, England, as well as to its neighbour the United States. (plum pudding)Traditional Christmas dinner features turkey with stuffing (dressing), mashed potatoes, gravy, cranberry sauce, vegetables and plum pudding for dessert. Eggnog, a milk-based punch that is often infused with alcohol, is also very popular around the holiday season. Other Christmas items include butter tarts and shortbread, which are traditionally baked before the holidays and served to visiting friends, at various Christmas and New Year parties, as well as on Christmas Day. In French Canada, traditions may be more like those of France. Other ethnic communities may continue to use old world traditions as well. Czech Republic A traditional Christmas meal in the Czech Republic is fried carp and potato salad. This tradition started after excessive increase of fishpond cultivation in the Baroque era. Many households also prepare a great variety of special Christmas biscuits to offer to Christmas visitors. These preparations take place many days and weeks prior to the feast and take a long time to decorate with the remainder usually ending up on a Christmas tree as a decoration. Denmark In Denmark the traditional Christmas meal served on December 24 consists of roast pork with crackling, goose, duck, or different combinations of these. The meat is served along with potatoes (some of which are caramelised), red cabbage, and plenty of gravy. 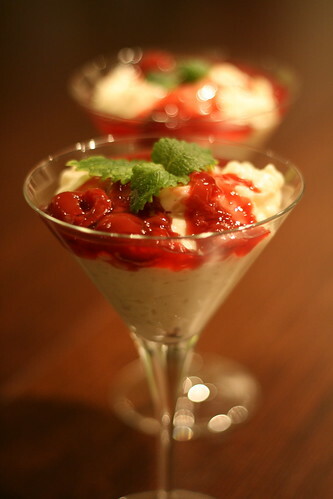 It is followed with a dessert of Risalamande, rice pudding served with cherry sauce or strawberry sauce, often with a whole almond hidden inside. The lucky finder of the almond of which is entitled to an extra present, the almond gift. Christmas drinks are Gløgg and traditional Christmas beers, specially brewed for the season. These usually have a high alcohol content. Finland Joulupöytä (translated “Christmas table”) is the name of the traditional food board served at Christmas in Finland, similar to the Swedish smörgåsbord. It contains many different dishes, most of them typical for the season. 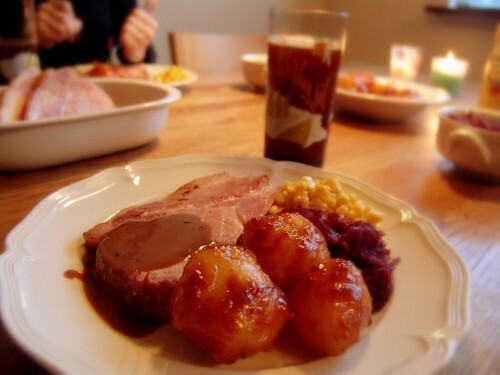 The main dish is usually a large Christmas ham, which is eaten with mustard or bread along with the other dishes. Fish is also served (often lutefisk and gravlax), and with the ham there are also laatikot, casseroles with liver and raisins, as well as potatoes, rice, and carrots.The traditional Christmas beverage is either alcoholic or non-alcoholic mulled wine (glögi in Finnish). France In France and some other French-speaking countries, a réveillon is a long dinner, and possibly party, held on the evenings preceding Christmas Day and New Year’s Day. The name of this dinner is based on the word réveil (meaning “waking”), because participation involves staying awake until midnight and beyond. Common dishes include goose or duck liver (foie gras); oysters; smoked salmon; lobster; roasted duck, goose or turkey with chestnuts and stuffing; and, for dessert, a traditional Christmas cake called “La Buche de Noel” (Christmas log), a cream cake that comes in different flavours (chocolate, hazelnut…) and which has the shape of a log. The beverage served is traditionally Champagne. Germany In Germany the primary Christmas dishes are roast goose and roast carp, although suckling pig or duck may also be served. Typical side dishes include roast potatoes and various forms of cabbage such as kale, brussel sprouts and red cabbage. 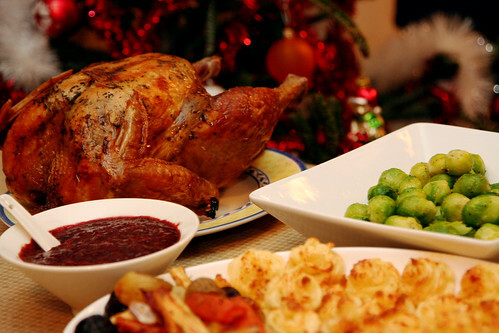 In some regions the Christmas dinner is traditionally served on Christmas Day rather than Christmas Eve. In this case, dinner on Christmas Eve is a more simple affair, consisting of sausages (such as weisswurst) or macaroni salad. Sweets and Christmas pastries are nearly obligatory and include marzipan, spice bars (lebkuchen), several types of bread, and different fruitcakes and fruited breads like Christstollen and Dresden Stollen. (Hamborgarhryggur)The Christmas dinner is eaten on Christmas Eve at 18:00. The main dish varies much between families. The most common is probably Hamborgarhryggur, which is a kind of pork rib steak. (Other common dishes are roast game like reindeer, ptarmigan and smoked lamb, (hangikjöt) and a great variety of steaks such as Duck, Turkey which are also eaten by many on Christmas Day or at other occasions during the Christmas period. Mexico In Mexico the Christmas dinner, eaten on Christmas Eve evening, varies with region. Common dishes are various fruits (oranges, lime, tropical fruits) and salad (composed of several ingredients including jícama, beets, bananas, and peanuts).In several states, however, stews are made: either pozole, made of pork or beef and hominy in red chile sauce; or menudo made with beef tripe and hominy also in chile sauce. In the center of Mexico, bacalao (codfish) and romeritos (rosemary) prepared with mole are popular dishes. In the north of Mexico the most traditional Christmas dish is tamales served with sauce over them and sometimes cream and a bit of crumbly fresh cheese. For dessert, atole (a thinned hot pudding) with buñuelos (fried flour tortillas sprinkled with sugar and cinnamon), or buñuelos soaked in sugar (piloncillo) and cinnamon water, are served. There are also sweet tamales: corn with raisins or sweet beans, or strawberry flavored. Stuffed turkey or ham are also common. (pinnekjøtt)The most common dish is ribbe, which is pork ribs. In the western parts of the country, “pinnekjøtt”, sheep, is by far the most popoular Christmas dinner. The traditional lutefisk is also still eaten by some, but it is more commonly eaten at other occasions during the Christmas period. PhilippinesThe Christmas dinner in the Philippines is called Noche Buena by locals. This usually comes after the entire family has attended a late evening mass called Misa de Gallo, or “midnight mass” in Spanish. 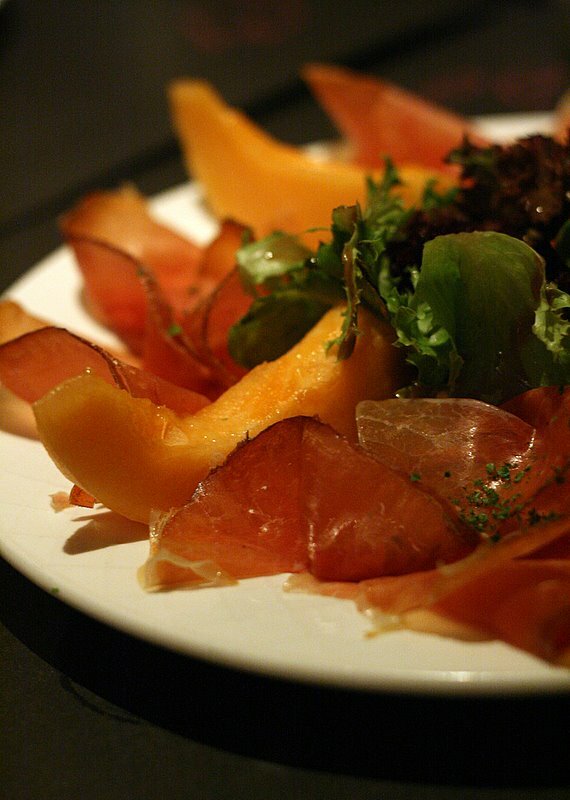 (jamon)The centerpiece of a Filipino Christmas dinner is often the Jamon or Christmas ham, which is usually a cured leg of pork ham. It is usually served with Queso de Bola, an Edam cheese ball served popularly during the Christmas season in the Philippines. Middle-class and affluent families tend to prepare a gracious dinner, including lechon or spit-roasted pig, lumpia, escabeche, adobo, rellenong manok (stuffed chicken), mechado (beef stew), caldereta (spicy beef stew) and other popular Filipino fare. Lower-income families would tend to prepare a dinner of much cheaper proportions but nevertheless it is always a Philippine custom to spend more on what a family would consume on a regular dinner for the Noche Buena. The dinner would usually be accompanied with “Tsokolate” or hot chocolate, which is Filipino in style since it is made with pure, locally-grown cacao beans. 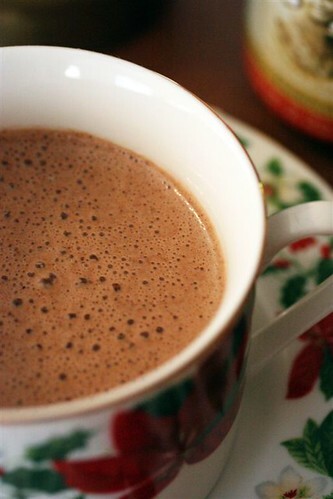 Some Filipino families prefer hot chocolate made from “tableas” or chocolate tablets. The importance of the family in Filipino culture is highlighted during the Noche Buena since members from even the extended branches of the family are always expected to come and join in the celebration. Filipino families prefer to exchange Christmas presents right after the dinner, which is different from the usual Western culture of opening presents on the morning of Christmas Day. Peru On Christmas Eve (Noche Buena), the extended family join together for a succulent dinner around the turkey, stuffed with ground beef and peanuts and decorated with fresh slices of pineapple and cherries; roast potatoes and apple sauce. The desserts include marzipan and assorted bowls with raisins, almonds and the panettone, accompanied by a cup of thick hot chocolate. At midnight, a toast is made, and good wishes and hugs are exchanged. A designated person runs to put Child Jesus in the Nativity scene. Then, the family members take their seat on the dining room while singing Christmas Carols. Slovakia Christmas dinner in Slovakia, as in Austria, the Czech republic, and Hungary, is celebrated on 24 December.The traditional dinner includes Oplátky (thin waffles with honey and garlic), cabbage soup with prunes and sausage, carp or other fish with potato salad, and Christmas biscuits. United Kingdom and Ireland Christmas dinner in both the United Kingdom and Ireland is usually eaten in the afternoon. 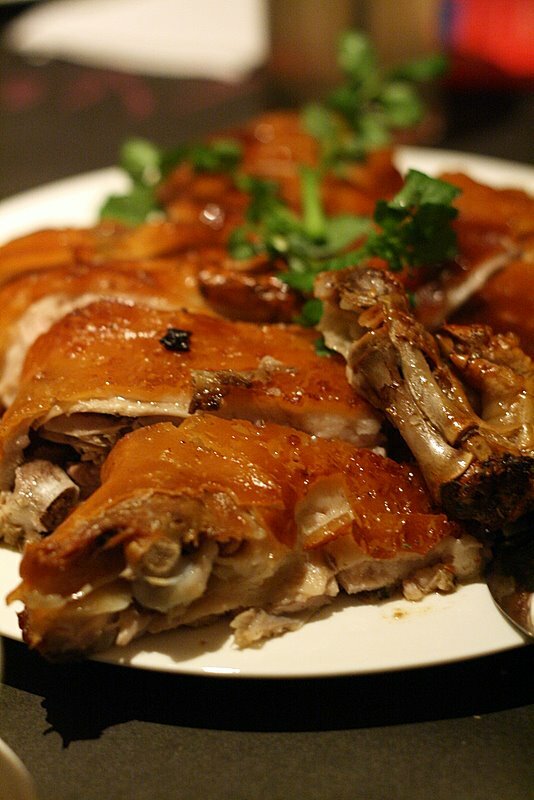 The dinner usually consists of roast turkey (although other types of poultry such as goose, chicken, duck, capon or pheasant are common alternatives depending on the number of diners), sometimes with roast beef or ham or, to a lesser extent, pork. Served with stuffing and sometimes forcemeat; chipolatas and rolled bacon or pigs in blankets; cranberry sauce or redcurrant jelly; bread sauce; roast potatoes (sometimes boiled or mashed); vegetables (usually boiled or steamed), particularly brussels sprouts and carrots; with dessert of Christmas pudding (or plum pudding), sometimes mince pies or trifle, with brandy butter and/or cream. In England, the evolution of the main course into turkey did not take place for years, or even centuries. At first, in Medieval England, the main course was either a peacock or a boar, the boar usually the mainstay. After the French Jesuits imported the turkey into Great Britain, it became the main course in the 1700s. A common tradition in the United Kingdom is to use the turkey’s wishbone. Two people pull opposite ends of the wishbone until it breaks, with the person holding the larger fragment of the bone making a wish. The dessert of a British Christmas Dinner may often be Christmas Pudding. Mince pies, a Christmas Cake or a Yule Log are also popular. United States Many Christmas customs in the United States have been adopted from those in the United Kingdom, although customs from other countries are also found. Accordingly, the mainstays of the British table are also found in the United States: roast turkey (or other poultry), beef, ham, or pork; stuffing or dressing, corn, squash, green beans, and mashed potatoes are common. 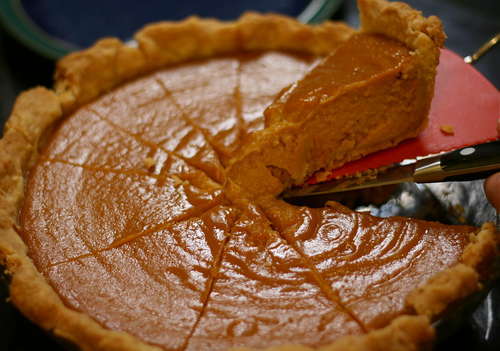 Dessert often reflects the ethnic background of the participants, but examples include pumpkin pie, marzipan, pfeffernusse, sugar cookies, panettone, fruitcake, apple pie, carrot cake, bûche de Noël, and mince pie. 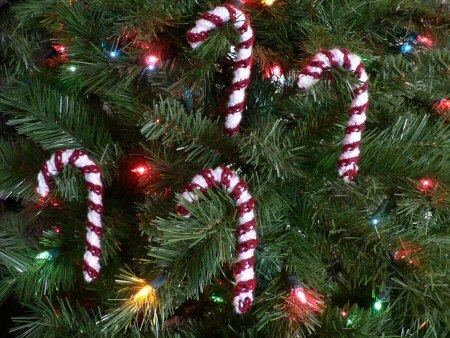 Children often help their parents in the kitchen making the meal and often get special sweet rewards, like popcorn balls, gingerbread houses, and candy canes, the last usually munched on as they are hung on the tree. The centerpiece of a sit-down meal varies on the tastes of the host but can be ham or roast beef, particularly since turkey is the mainstay at dinner for the American holiday of Thanksgiving in November, almost exactly one month earlier. Regional meals offer incredible diversity. Hawaii has Turkey teriyaki and pork dishes, the latter a carryover from Polynesian and Asian traditions, and often seasoned accordingly with fresh pineapple or soy sauce concoctions. Virginia has oysters, ham pie, and fluffy biscuits, a nod to its very English 17th century founders. The Upper Midwest includes dishes from predominately Scandinavian backgrounds such as lutefisk and mashed rutabaga or turnip. New England often has desserts like corn pudding or plates with linguiça sausage, respectively from Native American and old Portuguese recipes. In the Southwest and portions of California, both with distinct Spanish heritage and large Hispanic populations, a traditional Christmas dinner might include posole, tamales, empañaditas (mincemeat turnovers) and biscochitos. In some rural areas, game meats like elk or quail may grace the table, often prepared with recipes that are extremely old: it is likely that similar foodstuffs graced the tables of early American settlers on their first Christmases. In the United States, it is increasingly not unheard of for people of very different ethnic backgrounds to gather around the table, especially on Christmas Eve when it is common to receive friends as guests and have parties. Thus, dishes that have been handed down over generations often mix at the table; a feast can include an old Neapolitan recipe for eel as a dish, a plate of black eyed peas (African-American origin) and desserts of French-Canadian origin. As the Christmas season often runs very close to Hannukah and the U.S. has an extremely large Jewish population, many Christian Americans often invite their Jewish neighbors and friends over for dinner as a sign of goodwill and love: sometimes (and especially in families where more than one religion exists) one shall see a plate of latkes on the table and small bags of chocolate coins for the children alongside the candy canes.